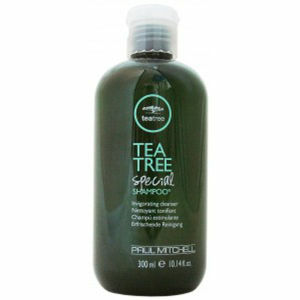 Gently cleanse and refresh the hair and scalp with the award-winning 'Green' Tea Tree Special Shampoo from Paul Mitchell. Developed with a unique formula of natural tea tree oil, peppermint and lavender, the lightweight shampoo effectively removes excess oil, dirt and impurities without stripping moisture. Experience an invigorated and comfortable scalp with a cool tingling sensation and healthy-looking, revitalised locks that are silky smooth. Paraben free, colour safe and suitable for vegans.